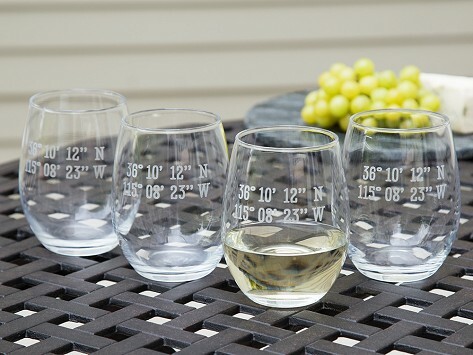 Let these personalized wine glasses serve as an everyday reminder of a special place. 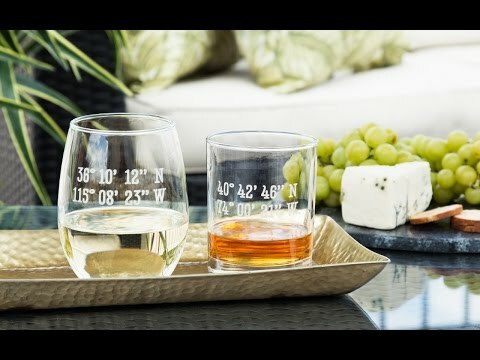 Send Susquehanna Glass Company any location, and they’ll find the coordinates to create wine glasses just for you. The Latitude and Longitude design is an exclusive collaboration with us that uses sand etching to leave a clean, crisp finish. Each glass is created in the USA with a keen eye for detail and a strong tradition—over 100 years and counting—of craftsmanship. Dimensions: 3.75" D x 5"
Ordering on The Grommet is an easy process and the selection of unique gifts is great. The product came on time and was better than anticipated. A truly beautiful and unique product. These glasses are absolutely beautiful. Very high quality with precision etching of latitude/longitude coordinates of our home. This is the second set of these glasses that I have ordered. They are a great topic of conversation among friends because everyone wonders what the numbers mean!